Since early 2018, Tatmadaw has extended the area under their control and trespassed into territory controlled by the Karen National Union (KNU). They built a military road without prior permission from KNU authority and local civilians. In this context, Tatmadaw soldiers murdered the indigenous defender Saw O Moo on April 5th 2018 when he was on his way back home after a meeting to coordinate humanitarian aid for internally displaced people (IDPs). The location of Saw O Moo's body is unknown. His family has been unable to hold a funeral according to their animist tradition. Naw K--- is calling for peace. She urges the Tatmadaw to withdraw all of their troops from her area in order for her family and other local civilians to live in peace. The following Interview was conducted by a community member trained by KHRG to monitor local human rights conditions. It was conducted in Hpapun District on April 13th 2018 and is presented below translated exactly as it was received, save for minor edits for clarity and security. This interview was received along with other information from Hpapun District, including 15 other Interviews, 3 Incident Reports, 1 Situation Update, and 177 photographs. Good afternoon. I work for the Karen Human Rights Group (KHRG). I received information that Tatmadaw forces entered your village and committed human rights violations forcing civilians to flee [into the forest]. Civilians are facing many challenges while being displaced. I would like to interview you about these incidents. You can provide information about anything you have [experienced]. You do not have to be afraid or concerned for your security because KHRG will prioritise your and your family’s security. My name is Naw K---. My current village is G--- village. I lived in H---village before I married my husband [who is a villager from G--- village]. Which village tract, Township and District do you live in? I live in Ler Mu Plaw village tract, Lu Thaw Township, Mu Traw [Hpapun] District. My oldest child is 14 years old. My youngest child is 10 months old. Since the 2012 Preliminary Ceasefire Agreement, have you faced any challenges [human rights violations]? The challenges that I face include the Tatmadaw entering into our area and defeated [committed human rights violations against] us so we had to flee into the forest to save our lives. They [the Tatmadaw] said if they see any villager, they would not do anything against them [commit violent abuses]. They are untrustworthy. When they saw my husband, they shot and killed him. My husband was just a villager. When did they shoot and kill your husband? They shot and killed him on April 5th 2018 at 5:20 PM. Can you describe how the Tatmadaw murdered your husband, please? Tatmadaw shot and killed him on his way back to [G---] village. He was returning from [a meeting] for his work and was on his way to a wedding. Before he arrived at the location of the incident, he met a soldier. A man interjected to clarify - "he is a Battalion Deputy Commander from the Karen National Defence Organisation (KNDO)." [Naw K--- continued:] The soldier had four mortar shells and two guns. The soldier asked my husband to give him a ride to Ler Mu Plaw area. As my husband was just a villager, he had to do it. The soldier carried his weapons on him. [After Tatmadaw shot my husband], Tatmadaw seized the four mortar shells [of the KNDO soldier] and my husband's video camera. What was your husband’s role in your community? He was working for indigenous rights and environmental conservation [as a member of the Karen Environmental and Social Action Network]. Was the soldier [who was riding with your husband] from the Karen National Liberation Army [KNLA]? A man interjected - "That soldier is a Company #2 Battalion Deputy Commander of National Defense Organisation [KNDO] Battalion #1." [Naw K--- continued], on the way before he [Saw O Moo] arrived [at T'Ree Plaw area], he met that soldier [a Battalion Deputy Commander from KNDO Battalion #, Company #2 of] and he asked my husband to take him to Ler Mu Plaw area [where Saw O Moo is from] by motorcycle. My husband was still travelling [during the conflict period] because the Nationwide Ceasefire Agreement was signed. He was just a villager so he believed that Tatmadaw would not shoot him. Tatmadaw said [from the Tatmadaw statement] they ordered him [Saw O Moo] to stop the motorbike, but he did not stop so they shot my husband. This was not true, they immediately shot him. They did not order my husband to stop first. No, he was not. He could escape safely and had guns with him, but his four mortars shells were left behind at the incident place. How did you find out that Tatmadaw shot and killed your husband? I heard the sound of gunfire because it was not far from here [G---Ler Mu Plaw village]. People informed me that [Saw O Moo] was on his way back to his village. [Before I heard the gunfire], I waited for him to arrive home for a day, but when he did not arrive home, I was sure that [Tatmadaw shot and killed him]. Do you know which Tatmadaw battalion murdered your husband? What challenges are you facing after your husband’s murder? I am just a woman who has to overcome challenges for my family’s livelihood alone. I need to raise my young children alone. These are my major challenges. 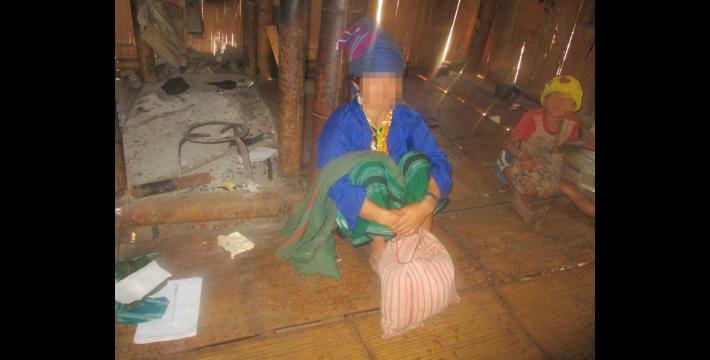 I am currently displaced in the forest because of the Tatmadaw [military] activities so I cannot do anything [to secure my family’s livelihood]. My husband was always talking about his dream for our children. He wanted them to be educated and told his colleagues, "I am working on this job and if I die one day, I hope that my co-workers and my leaders will support my children’s education so that they will be able to go to school." I am just relating what he said. I told him, "Don't talk [about death] like that. You still have to work [for the community]." Unfortunately, he really was murdered by Tatmadaw. I cannot do anything, there are many challenges that my family is facing, and I have to overcome them alone. Do all of your children go to school? My two youngest children are too young to go to school yet, but all of my five older children go to school. Where do your children go to school and which grade are they in? Some [three of my] children go to school in the village. My other two children stay with their aunt [and go to school in another village]. My oldest child has to attend Grade 6 [this year]. What do you need in the future [that would benefit your family]? I do not want to see Tatmadaw troops enter into [local civilians'] area to conquer us. I want to see all Tatmadaw troops removed from my area in order to work on my farm like in the past [without Tatmadaw] in peace. I hate Tatmadaw and I will continue to detest them until I die. Do you remember the date you left your village? I am temporarily displaced in I--- hiding site in the forest. How many households are you currently hiding with [in I--- place]? There are only three other households that fled with us. What are the challenges you have been facing since you fled into the forest? Securing enough food [for my family] is the biggest challenge for me. Another challenge is obtaining healthcare services. Have the Tatmadaw troops stopped their project yet? No, they did not. They might have another plot against us [local civilians] that we cannot know. If the Tatmadaw do not withdraw their troops, what problems will the local community face? Local community members work on their farms for their families’ livelihoods. If the Tatmadaw does not withdraw their troops, there will be a lot of major [livelihoods] challenges facing us. They want to construct a military road [in our area], but we [local civilians] did not allow it. The Tatmadaw does not have to construct a road [without the permission of civilians] because we can construct our road when we need it. Where does Tatmadaw want to construct a road? The road [that Tatmadaw wants to build] will be from here Ler Mu Plaw [village tract] to Kay Pu [village tract]. Did you receive prior information that [Tatmadaw] intended to build a road? I just heard people saying that the Tatmadaw would construct a military road. We did not know what the details were or when they wanted to build the road. The Tatmadaw entered [to Ler Mu Plaw area] immediately without prior notice. They also put letters beside the civilian road saying that they will not shoot local villagers. They also asked villagers to meet them. When local community members went to the place described in the letter, they did not see them. The Tatmadaw troops that put the letters up are not the same troops that are currently constructing the road. What is your husband’s name? Do you want to give us more information about your husband’s murder? People are looking for him [Saw O Moo’s body] but they have not found it yet. Tatmadaw [soldiers] are untrustworthy because they are not loyal [to civilians]. They shot my husband. People looked for him [Saw O Moo’s body] after the incident, but we could not find him anywhere. Tatmadaw reported all of the objects they seized from my husband [in a statement they released], but they did not say anything about his body or the location of his grave. What materials did the Tatmadaw get [according to their statement]? The Tatmadaw reported that they arrested [Saw O Moo with] a video camera, a phone, an audio recorder, and a Burma/Myanmar Identification Card. Did Tatmadaw send these materials back [to you]? No, they did not. They [Tatmadaw] also stated that: "They ordered him [Saw O Moo] to stop, but he did not stop so they shot him." I confidently believe that it is not true. He did not run away any further because many of the bullets hit the bamboos and trees, and there was major bleeding at the incident place so how could he have kept running. The fact is that Tatmadaw hid my husband’s body. I am extremely unhappy that I cannot see his body and organise a proper funeral for him according to our animist tradition. Have you reported your husband’s murder to any authorities? For example, did you report it to the Burma/Myanmar government authorities, KNU authorities or any other organisations? I strongly urge Tatmadaw to withdraw their troops from my area so that local civilians can work on our farm in peace. Tatmadaw forces must not be based in our area anymore. Have you asked for compensation from Tatmadaw forces for your husband’s murder? No, I have not. Even if I ask them to resurrect my husband, they definitely cannot do it so I urged them [Tatmadaw] only one thing to go back [withdraw their troops]. What would you want the Tatmadaw to do as compensation for your husband’s murder? I do not want any compensation money from Tatmadaw. They murdered my husband so they must go back [withdraw their troops from my] area. I strongly urge them to withdraw all of their troops. I do not want to see them in my area. This is my desire and I just want to live with my family and friends in peace without Tatmadaw. I am happy to pay money to them, around 3,000,000 kyats, with the support of my friends so that they withdraw from my area. I want to urge the Tatmadaw to withdraw from my area because I want peace; I want to live with my family in peace and for other civilians to live in peace on their land. What are the difficulties facing your family? Such as healthcare services or others. I am happy when I see all my children healthy. Because I am currently displaced in the forest, the biggest problem I am facing is when my children are sick. I cannot access help from my relatives or help them. If I can return to my village, I could easily access help from my relatives and help them with anything. Could you please describe your experience for me? My mother passed away when I was a child so my father raised us [my siblings] alone. We [Saw O Moo and I] fell in love so we married each other and worked [on our farm] together for our livelihoods. We always helped each other and now, he left us [Tatmadaw murdered him] so I have to raise my seven children alone in difficulty. How did your mother pass away? She was accidentally killed with a gun. The gun was accidentally fired when my innocent younger brother was playing with it. At the time, my youngest sibling was only 6 months old and now is 22 years old. I have ten siblings and I had to raise my younger siblings with my father during the conflict. We also had to flee for our lives and faced the same difficulties we are currently facing. We did not have enough rice [food] in the hiding site. Whose gun and what kind of gun killed your mother? It was musket that we used for hunting wild animals. Could you please explain how this incident happened? My five-year-old brother played with that musket so it was fired and accidentally hit my mother when she was collecting vegetables. My brother was too young so he did not know what happened. Did the people put the musket close to your brother? My mother took my father's musket when she was collecting vegetables on our farm. She put the musket in the farm tent when she arrived at the farm and then she started collecting vegetables. My brother was too young so he played with the musket and the musket accidentally fired out and hit my mother. I was around 12 years old. Do you have any other information that you would like to provide us? As I already mentioned, I am calling for Tatmadaw army troops to withdraw from my area. Only then, I will be able to live in peace and prosperity. 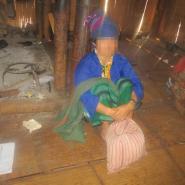 Tatmadaw murdered my husband and I had to flee into the forest and face many difficulties with my young children. If the Tatmadaw leave my area, we can return to our land and my children can live in peace. They [the Tatmadaw] must go back. They must go back. This is my biggest desire. Can we use the information that you have provided us for publication? You can use it for good purposes, but I do not want this information to be used [in any way that benefits or helps] the Tatmadaw. We will publish the information that you have provided us so that stakeholders and the international community can learn about the human rights abuses committed by the Tatmadaw. Thank you.